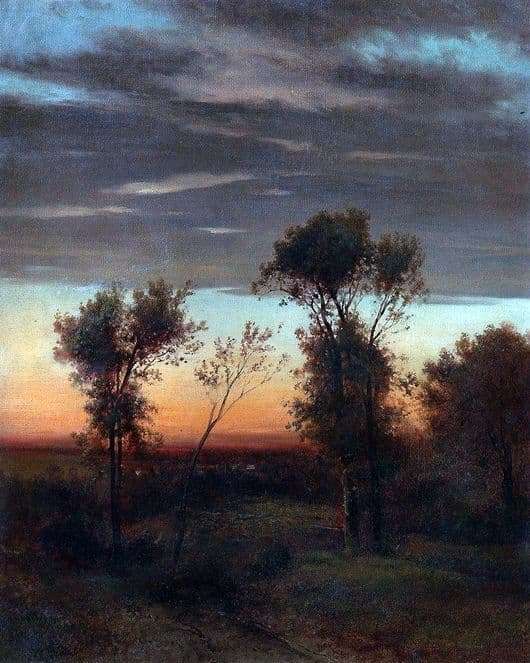 Incredible in its beauty and technique of painting, the great artist Savrasov, called “Evening”. The picture is made in oil on canvas and amazes the viewer with his poetic performance and transfer of the energy mood of the picture. The artist chooses the perfect moment to draw the sunset, as you can see, nature and everything living around is getting ready for bed, while the sky is filled with gorgeous, almost all colors of the rainbow colors. The canvas is conventionally divided into three parts, the bottom is completely given to dark brown and dark green tones, which perfectly show the soil and grass. Also visible is a certain path that goes deep into the canvas. As for the middle of the picture, only the tops of the trees slightly hinder the viewer in order to fully enjoy the magnificent modulations of tones and subtle transitions of colors, thanks to which the master managed to perfectly convey the state of nature, colors and colors exactly as they were at the time of writing. Excellent study of light and shadow allowed the artist to make a slight emphasis on the fact that the leaves are playing relative to the sunset, thus it becomes clear why the artist chose this angle and place of view for his picture. The upper part of the canvas is completely given to the imperturbable sky, which exceptionally contrasts the whole image in the picture, the sky with its clouds is the ideal counterweight to the earth in this picture. If it is clear from the bottom of the picture, this is an unconditional basis, which is immovable, then the sky is completely the opposite done so dynamically that sometimes it seems that it is clear how clouds move across the sky. Thus, it is very difficult to take your eyes off the picture, it is completely captivated by its unobtrusiveness.